We have talked about the history of Popeye's arch-foe Bluto quite a bit [click here] - so how come he, after being introduced to the comic strip in 1932, was used exclusively in the Fleischer and Paramount cartoons but didn't return to either the comics nor cartoons by other studios until much much later (despite the many recurring bearded villains Popeye had to fight)? I am speculating but is it possible E.C. Segar, Bluto�s creator, felt he was needed only as a onetime villain in the comic strip. Popeye had a fierce battle with the bearded brute in 1932, then moved on to other opponents. Tom Sims, who was Segar�s successor on the scripts, apparently felt the same way until Ralph Stein took over the writing chores. On March 27, 1957 Stein wrote Bluto back into the daily strip and he became Popeye�s recurring nemesis chiefly as a treasure seeking, machine gun carrying, pirate. It is possible Bluto�s popularity in the theatrical films, which became a smashing success on television, may have played a part in Stein�s decision to write him back into the daily strip. The Popeye-family, circa 1950's, featuring "Mean Man"
If I'm correct, the first time a Bluto-style villain was introduced back into the Popeye-comic books was in 1957, who I believe eventually emerged to being Sonny Boy. So what can you tell us about this character's creation and his origin story? Sonny Boy was created by Bud Sagendorf who was Segar�s assistant. He was a muscular bearded brute, wearing a captain� hat, who was the son of Popeye�s most hated enemy, The Sea Hag. His origin involved Paramount Pictures, who produced the Popeye theatrical films, claim they owned the name Bluto. Actually the bearded brute first appeared in the comic strip in 1932 distributed by King Features Syndicate. The character was taken from the strip and used in the Betty Boop cartoon Popeye the Sailor (1933). Sagendorf stated, thanks to the success of the theatrical cartoons on television, Bluto was becoming a popular character but he could not be re-introduced in print with his original name. I discovered something was amiss when I ran across a �Popeye Family� drawing where Sagendorf used the name �Mean Man". What other characters shared Sonny Boy�s character design? Why didn�t the character design for each vary? 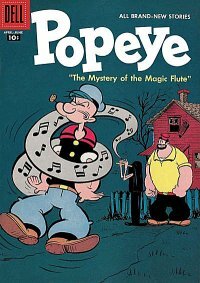 The first character to appear in the comic book series sharing Sonny Boy�s looks was known as �The Big Guy That Hates Popeye� who debuted in Popeye #40 (The Mystery of the Magic Flute,1957). He appeared on this issue�s cover wearing a red sailor�s hat. The hat was probably added to make the public believe this was the more familiar Bluto. He makes little more than a cameo appearance in the interior. Popeye #41 (Spinach Soap, 1957) billed him as Olive�s new �boyfriend� while in Popeye #42 (On Trap Island, 1957) he went unnamed while plotting with The Sea Hag. As previously mentioned Sonny Boy bowed in issue #43 (Mind Over Muscles, 1958). Bud Sagendorf used characters who shared Sonny Boy�s visual design in subsequent issues. For example in Popeye #47 (Popeye�s Cafe, 1959) he is the new owner of �Mike�s Place�, Popeye #48 (Strong Man, 1959) presents him as �The Strong Man� and Popeye #49 (Trillionaire Lady, 1959), dressed him up as �The Duke of Crust�. I can only assume Sagendorf did not vary each of these brute�s character designs because the public expected Popeye to be seen battling muscular bearded bullies. Whatever his name, children reading the comic books at this time probably thought he was Bluto. When Al Brodax started producing Popeye cartoons for television in 1960, his bearded villain was called Brutus. Now what can you tell us about the creation of that character, and why the name Brutus? Brasch pretty much covers the reasons for the creation of Brutus for the television cartoons although, as research bears out, Bluto first appeared in the comic strip which was syndicated by King Features. 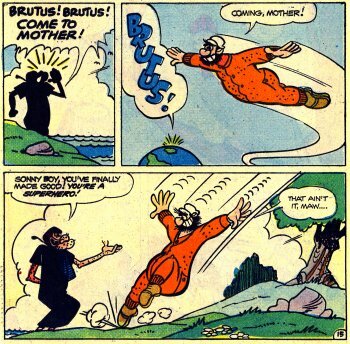 When and how was Brutus introduced into the Popeye comicbooks? Brutus first appeared in Popeye #64 (1962) in a story called Moon Plant. However, in this same issue, an unidentified bearded brute, resembling Sonny Boy, was seen in the story Rowboat War. Popeye #66 (1962) was a giant-sized issue and Sonny Boy returned to help his mother, The Sea Hag, in Witch Ship. The name Brutus seemed to stick with his appearance in Ghosk Mountain from Popeye #67 (1963), which was another giant-sized issue. Was the transition from Bluto to Sonny Boy and finally Brutus a smooth one? Over the years, similar looking Popeye-villains appeared in various media, including daily and Sunday comic strips, animated cartoons, and toys and other products, but under a variety of different names. Could you elaborate on that? The transition from Bluto to Brutus in the animated films was smooth. It was Bluto who plagued Popeye in the theatrical films produced by both the Fleischer and Famous Studios. In the television cartoons, animated by five different studios for King Features Syndicate, it was Brutus. Writer Ralph Stein�s first Popeye daily strip (illustrated by Bill Zaboly) was dated December 6, 1954. 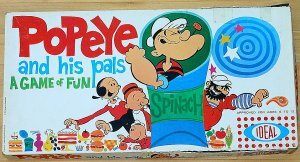 As previously mentioned, he reunited the spinach-eating sailor with Bluto on March 27, 1957. The pair would continue to meet, with Stein at the helm, until May of 1959. 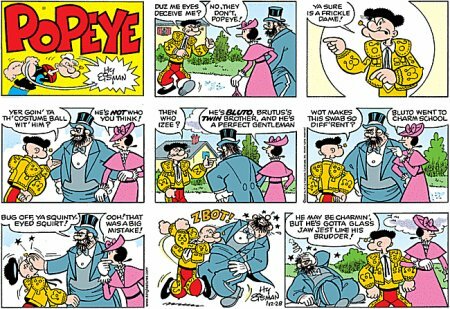 Of course, while all this was happening in the daily strip, unidentified bearded brutes or Sonny Boy bothered Popeye in the comic books by Bud Sagendorf. I would suspect Stein was so far ahead in his work load it would have been virtually impossible for King Features Syndicate to remove the name, Bluto, from the completed dailies. 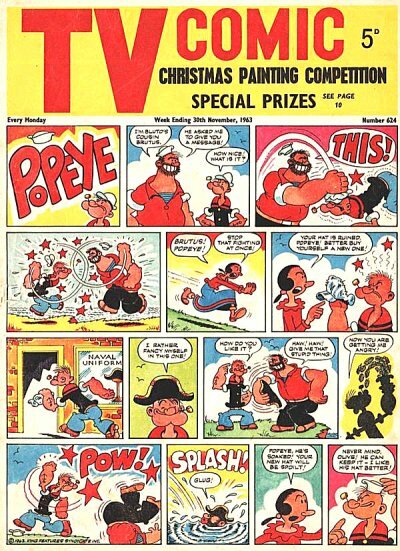 Another theory is Popeye�s visibility was far greater in the comic books thus the Bluto issue was more of a concern in this medium rather than the newspaper page. Beginning on August 10, 1959 Bud Sagendorf was now writing and drawing the daily strip. On September 29, 1959 an unidentified bearded brute encountered Popeye. To the casual reader, or a frequent viewer of Popeye�s cartoons on television, in their minds this was Bluto. 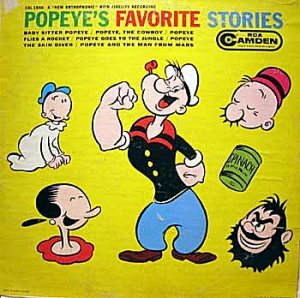 In the daily dated August 5, 1960 The Sea Hag instructed her �Sonny Boy�, with a bulbous dented nose, to beat up Popeye. On November 12, 1962 a daily story called, The Door to Nowhere or Knock! Knock! or Who�s There began. The Sea Hag, with the help of her son, planned on launching Popeye into space. In the daily dated December 22, 1962 Wimpy refers to the witch�s helper as her �boy�. However, on January 29, 1963, Olive says to The Sea Hag, �It�s your fault my sailor boy is in that hole with Brutus!� In this story The Sea Hag�s bearded �Sonny Boy� was christened, Brutus. By the time he returned to the daily strip on March 8, 1965 he was no longer related to The Sea Hag. The long gap between appearances was possibly Sagendorf�s way of having Brutus remerge without reader�s associating him with Sonny Boy. Bud Sagendorf�s first Sunday page was published on September 13, 1959 and nameless bearded brutes would pop up literally to supply the PUNCH line. Beginning in September and through October of 1962 Sagendorf produced a Sunday story arc featuring The Sea Hag and her son. In the Sunday dated September 9, 1962 The Sea Hag was in town. Popeye informed Olive, �The ol� witch is lookin� fer a wife fer her son!� The September 16, 1962 Sunday saw Popeye beating the witch�s �baby� when the brute forced himself on Olive Oyl! 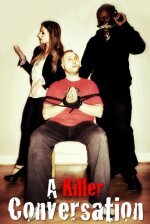 The beaten up suitor said to his witchy �mother�, �You and your big mouth! Ugh! Why didn�t you include that pop-eyed sailor in your motherly advice?� On Sunday, September 23, 1962 Olive explained to Popeye, �The Sea Hag�s son can�t help it if his mother is a real live witch!� The Sunday dated September 30, 1962 Olive said �It�s wonderful having two men in love with me!� She makes a date with Popeye, and in one panel, quite happily says on the phone, �That�s right Brutus... Sandy Point at one! We�ll have fun!� Popeye and Brutus arrive at Sandy Point battling each other furiously! I believe this is the first Sunday to use the name, Brutus. The following Sunday published on October 7, 1962, The Sea Hag can�t stand the idea her �beautiful son� is in love with Olive Oyl! The Sunday page dated October 14, 1962 had Popeye shouting, �There�s Olive with Brutus!� Basically Sagendorf started this story arc using Sonny Boy, then Brutus, back to Sonny Boy and finally Brutus! 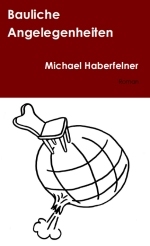 It is possible this was not Sagendorf�s intent and the publication dates of these Sundays were mixed up. Then again this could have been his way of subtly giving Sonny Boy the name Brutus as done in the daily. Upon his subsequent return to the Sunday page Brutus was no longer related to The Sea Hag. Two pilot animated cartoons were produced for television to help sell a new Popeye series to stations. One was Barbecue For Two. This cartoon, produced by Jack Kinney, was unique as it was the only one using the comic strip designs of the Popeye cast. In other words, instead of wearing his white sailor�s uniform, Popeye was dressed in blue pants, a black shirt with red striped collar and wearing a captain�s hat. Olive Oyl had her original homely look as opposed to the more attractive design featured in many of the theatrical films produced by Famous Studios. Popeye�s foe in this cartoon was a fat bearded �neighbor� whom Popeye called �Junior�. The copyright date of this cartoon was 1960 and it is probable made before Al Brodax dubbed him, Brutus! As for products, Bluto was featured on 1957�s Popeye Cartoon Kit by Colorforms, Popeye Color and Re-Color Book by Jack Built Toys and Adventures of Popeye Board Game by Transogram. 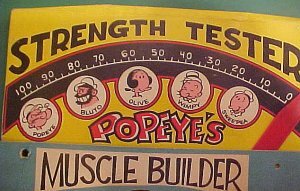 Bud Sagendorf provided the artwork for Popeye�s Strength Tester Muscle Builder by Welded Plastics Corporation. 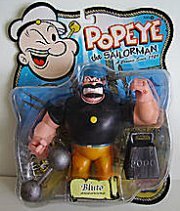 This toy was one of the few times Sagendorf drew Bluto and called him by that name. Popeye Printing Set by M. Shimmel Sons Inc. was copyrighted 1957 but featured a stamp called Mean Man. 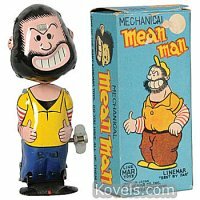 Linemar manufactured Popeye and Mean Man Mechanical Fighting Toy. The �mean man� design used was Bluto in his white sailor�s uniform from the color theatrical Popeye films. Linemar also came out with a mechanical Mean Man figure. Samuel Gabriel Sons and Company included a �Mean Man� barrel in their Popeye Barrels of Fun set (1958). By 1960, due to the popularity of the television cartoons, Brutus was now the name appearing on products. These included RCA Camden�s Popeye Favorite Stories Album (1960), Kenner�s Popeye Presto Paint Set (1961), Popeye View-Master (1962), Jaymar�s Popeye Funny Face Maker (1962), Popeye and his Pals Game by Ideal (1963) and Popeye�s TV Cartoon Kit by Colorforms (1966) On the Kenner�s Give-A-Show projector slides, Popeye initially battled a muscular, mustached bully followed by Bluto and Brutus. Throughout the rest of the 1960�s to 1990�s, with the occasional lapse to Bluto, Brutus was the name primarily used on Popeye items. The fact Bluto was used in the 1980 feature film did not slow down the use of Brutus in the merchandising department. It has only been in the past few years where King Features Syndicate has decided, for the most part, to brand the bully, Bluto. 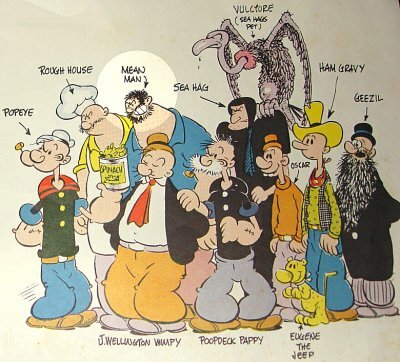 With the many different bearded villains Popeye encountered over the years: Do they at all vary in character? Segar had Popeye encounter bearded villains but it was obvious they were not meant to be Bluto. Bud Sagendorf was primarily responsible for inflicting Bluto looking bullies against the one-eyed sailor man. 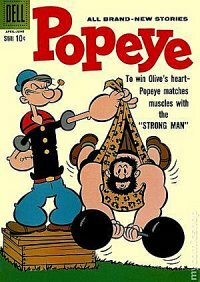 They pretty much were used to serve as Popeye�s punching bag to showcase his strength or jealousy. The main artistic changes on each character was the addition of a captain or sailor�s hat, squinty, plain black eyes or a white circle drawn around each. The noses were small or bulbous with a curve shape. Their hairstyles and beards were either unkempt or neat. Whatever attire these characters wore they highlighted a muscular or fat body shape. 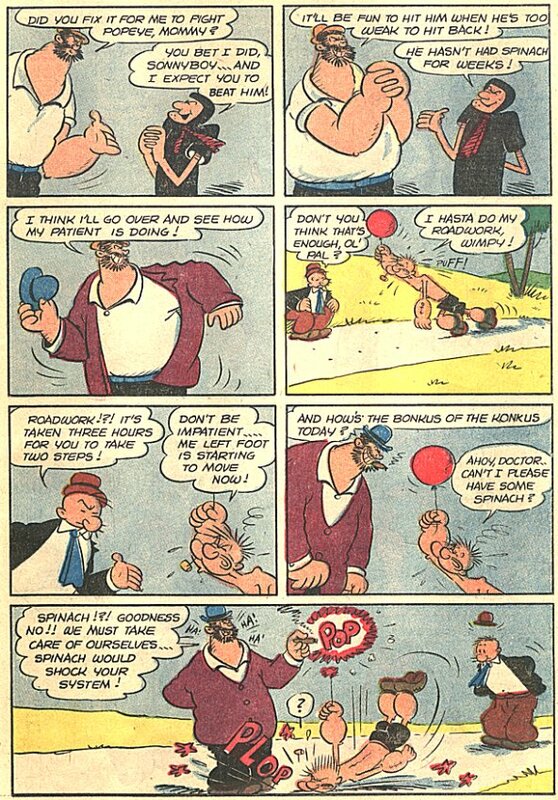 I asked Bobby London, who produced the Popeye daily strip for six years, what design best suited Brutus - �Brutus is the Gene Deitch (who produced some of the television cartoons) fat pinhead character with the black beard. Sagendorf drew Sonny Boy or The Sea Hag�s son who looked suspiciously like Bluto only in better shape with the same squinty eyes. Who the fat guy is with the two perpetually blackened eyes that Bud finally settled on is a mystery to me.� London is referring to the design of Brutus Sagendorf finally settles upon by 1967. How did Brutus become the Sea Hag�s son during the Charlton era? And these family ties were later abandoned again, right? FG: When did you begin corresponding with George Wildman? DP: It was immediately after reading The Story of Popeye in Charlton Popeye #108, so was early 1971, since his first reply is dated February 22. That story, written by Joe Gill and based on information from Bud Sagendorf, provided a brief history of the characters. Although it contained some errors, it was my first glimpse into the work of Elzie Segar, and I was fascinated. I wanted to know more. FG: Did you give George historical information on the characters? Is this what led to a correspondence regarding the history of Bluto and his subsequent monikers? DP: If I found anything interesting in older issues of the comics, I shared it with George. Along with his first letter to me, he included a copy of a letter he had written to an Army sergeant. The sergeant had asked about the names "Brutus" and "Bluto," and George asked Bud Sagendorf for information. The letter was not accurate, unfortunately, but Bud was presenting information he had been told. Apparently Bud had not researched the concepts himself at that time, and was relying on memory. FG: Do you recall what you wrote which gave George the idea to have Brutus become the son of The Sea Hag? DP: Yes, sometime in May 1972, I read Gold Key's Popeye the Sailor #66, cover-dated October 1962. I saw a bearded bully, and assumed it had to be Brutus. When I saw the references to this character being the Hag's son, with Popeye referring to him as �the Sea Hag�s orfspring� and the Hag calling him �Sonny Boy,� I wrote to George and informed him of this. We must remember this was in the early 70s, years before much had been printed, and even more years before a Google search could bring a mountain of information. Also, that was the oldest issue I owned at that time. I had no idea about the true legal wrangling�s involving the change of Bluto to Brutus. When I saw a huge, bearded villain, I assumed it had to have been Brutus, since that was the name of the character in the TV cartoons at the time this comic book came out. FG: Do you recall what issue, during the Charlton run, where readers learned Brutus was The Sea Hag�s son? DP: I have Charlton's Popeye #128, April 1975, in which Brutus calls the Sea Hag �Maw.� In flipping through Charlton issues prior to that, I don�t see a reference. Nick Cuti was writing the scripts at that time. Whether he saw the earlier Sagendorf comics and made the same assumption or if George shared my notes with him, I do not know. I do know both Nick and George visited with Bud Sagendorf in the 1970s. Also in Popeye #130, August 1975, in The Saga of Superstuff, the Sea Hag tells Brutus, �Throw Popeye to the Sharks, Sonny Boy,� as Brutus asks, �Now, Mother?� and there are others. FG: Years later historians had a better understanding of the evolution of Brutus. Sonny Boy was the Son of the Sea Hag who looked very much like Bluto. Bud Sagendorf used him in both the Dell and Gold Key Popeye series. Sagendorf also featured the brute in both his daily and Sunday comic strip. When the name Brutus debuted in the comic books in 1962, Sonny Boy vanished. When you discovered the facts what was your reaction? DP: I remember assuming the bearded bully was always supposed to be the same character, regardless of name. I later found more issues of the comics and noticed neither the name Brutus nor the name Bluto was being used. I knew there had to be a legal reason. I remember seeing Gold Key's Popeye the Sailor #67 with Brutus mentioned by name, and had no idea he'd appeared even earlier, in a Dell-issue, Popeye #64, April-June 1962. I did not see that issue until a couple of years ago, as a matter of fact. All of this is confusing, since Sonny Boy appeared in-between, unless those stories were released out of order. I never knew if they were all the same character, or if Bluto, Sonny Boy, and Brutus were actually three different characters. 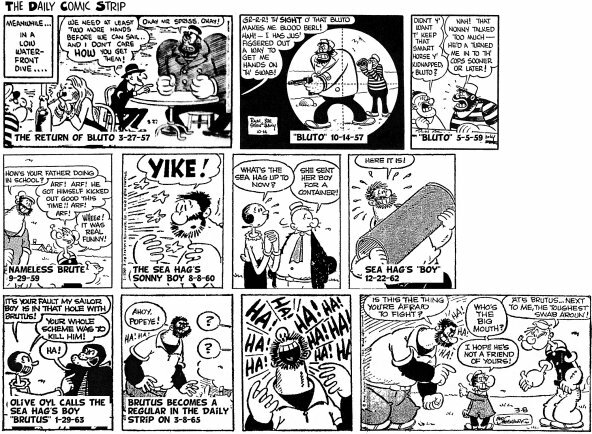 Years later, Ocean Comics introduced the concept of Brutus and Bluto being brothers, and more recently Hy Eisman used this in the Sunday newspaper strip. 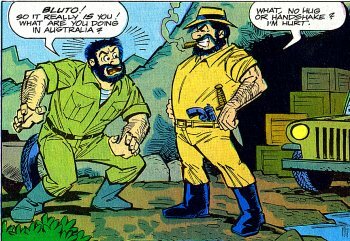 Even before all that, there was Burlo, Bluto�s beardless twin brother, when Ralph Stein was writing the comic strip with art by Bill Zaboly! Bud Sagendorf's account changed with the years, after he had researched his own archives. FG: Whew! Readers need to eat a lot of spinach to keep all that information straight! Okay, in your opinion, whom do you prefer, Bluto or Brutus? However �Bluto� actually did appear in a George Wildman comic book! 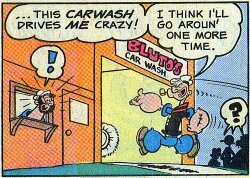 In Gold Key's Popeye the Sailor #148, July 1979, in the story �he Myskery of the Magic Marble, Popeye gets scrubbed (by his own choosing) by running through �Bluto�s Car Wash!� And there is the big guy himself, operating the controls! Bluto (or is this Brutus working for Bluto?) is never called by name, but the name on the car wash building is shown twice. Donnie Pitchford provided his October 15, 1978 telephone conversation with long time Popeye artist and writer, Bud Sagendorf, regarding Bluto & Brutus. DP: Another conflict I�ve wondered about is the Bluto/Brutus thing. I now know that Bluto was the original character from the comic strip. Do you use Brutus In the strips? BS: We use Brutus now. That was a copyright conflict. When King Features bought back all of the early animated things, Paramount Studios claimed that they owned the name Bluto. If King Features had been a little bit smarter, they would have seen that Segar used it long before the animation. Donnie Pitchford does not believe Brutus remained related to The Sea Hag after the Charlton era and I could not find any indication either. Please do discuss Bobby London's The Return of Bluto storyline from 1991/92 for a bit! 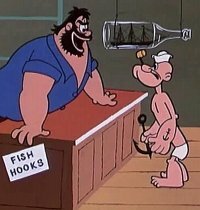 How did the idea that Bluto and Brutus were brothers get started, and its significance for the Popeye continuity? I contacted Hy Eisman and explained Bluto had never appeared in a Popeye Sunday comic strip. Eisman has been producing the Sunday page since 1994 and on December 28, 2008 Bluto made his debut. As in the Ocean Comics story he was introduced as the twin brother of Brutus. 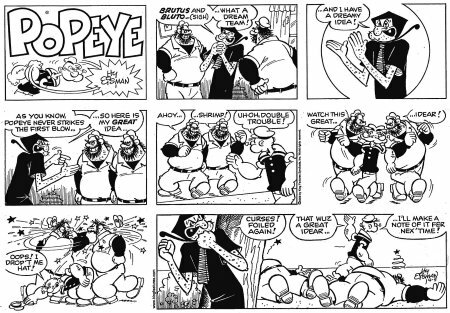 In the Sunday comic dated April 5, 2009 The Sea Hag recruited both Brutus and Bluto in her attempt to defeat Popeye. Today, is it Bluto or Brutus? In the new Sunday page by Hy Eisman it is still Brutus (the daily strip currently consists of Sagendorf reprints). While IDW was producing a new Popeye comic book it was Bluto. The name flip-flops on merchandise. Beginning in 2001 Mezco released several Popeye character figures and used Bluto�s visual design from theatrical films by both the Fleischer and Famous Studios. 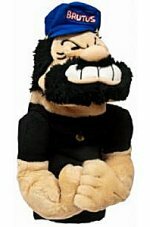 Several products have used the Fleischer Studios version of Bluto calling him Brutus. An example of this was a golf cover by Winning Edge. 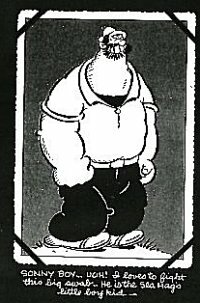 If you go to the Popeye character page at the King Features Syndicate website (http://kingfeatures.com/comics/comics-a-z/?id=Popeye) they use a Hy Eisman drawing of Brutus called Bluto. After all these years I would love to say things are less confusing as to who is who, but not quite yet. How did you gather all these facts, actually? A lot of the facts were discovered by reading the comic strip and books. Admittedly I was not necessarily looking for information regarding Popeye�s bearded opponent but stumbled upon it. I would like to take this opportunity to thank people who have contributed to this article: Debbie Brooks, Ron Fortier, Dave Hudon, Bobby London, Mile High Comics and Donnie Pitchford. Sonny Boy and Brutus stories worth reading, from whatever era? I would definitely check out Bobby London�s The Return of Bluto story which The Official Popeye Fan Club has archived. Please go to www.popeyethesailor.com/club/. 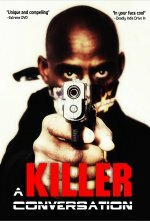 The name changes surrounding the brute were not limited to the United States. For example, Popeye Annuals were published in London for several years. While the name Bluto was originally used in these publications he was also known as The Big Man and later, Brutus. TV Comic 624 (November 30, 1963) had a bearded man, wearing a sailor�s hat; introduce himself to Popeye saying �I�m Bluto�s cousin Brutus.� Cousins? I can hear the theme song to The Patty Duke Show playing during this meeting.